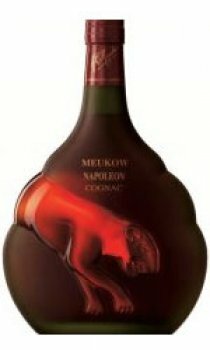 As symbolised by its unique bottle, combining traditional green frosted glass and crystal clear glass, Meukow Napoleon is a subtle marriage of fruity aromas and spicy tannins flavours. Beautifully clear bronze colour, brilliant with gold tints. Fruity with orange and vanilla nuances, dark chocolate ,spices and leather, cedar and walnut.